Preparation: Free download AVI to iPad 4 Converter. Install and launch it. 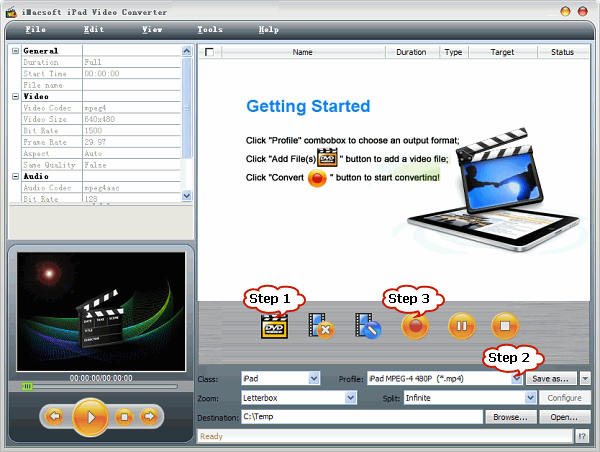 iMacsoft iPad Video Converter is just the ideal solution tool to convert AVI, HD AVI, Divx, Xvid to iPad 4 supported H.264 MP4 or MPEG-4. With the optimized preset for iPad 4, it is just easy to convert all kinds of AVI to iPad 4 supported format with great quality and high speed. Besides it can also convert other video formats including AVI, MKV, WMV, ASF, MTS, VOB, MPEG, MOV, RM, 3GP, high quality 1080p or 1080i MKV, M2TS and more to iPad 4 video MP4 or iPad 4 H.264 1080p video or 720p video. Click “Add Video” button to browse and load AVI files. Or you can directly drag and drop your AVI files to iPad 4 video converter. You can load multiple files at one time. If your source AVI files are in 1080p or 720p, you can convert AVI to iPad 4 supported 720p video. In the “Profile’ drop-down list, choose “iPad H.264 720p Video” from “iPad” category. Step 3: Convert AVI to iPad 4 Video. Press on the button of “Convert” at the bottom right to start AVI to iPad 4 conversion. Start iTunes, and then choose File > Add File to Library to import the converted AVI files to iTunes or you also can simply drag and drop this converted AVI movie to the iTunes Movie Library. Connect your iPad 4 and transfer the converted AVI movies to iPad 4. Now, you can play AVI files on iPad 4. It’s that fast and easy.